Carnival Corporation & plc (Carnival) today announced that Carnival Cruise Line has signed an agreement that will see Shell NA LNG, LLC (Shell) supply liquefied natural gas (LNG) bunkers to the cruise line's LNG-powered cruise ships in North America. The news comes on the heels of yesterday's announcement that Shell Trading (US) Company had signed a long-term charter agreement with Q-LNG Transport, LLC (Q-LNG) for a 4,000 cubic metre (cbm) LNG bunker barge, which is intended to supply LNG bunkers to vessels along the southern U.S. East Coast, including cruise vessels. 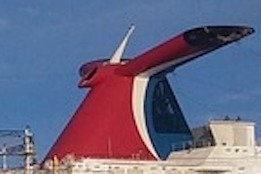 As Ship & Bunker has reported, Carnival Cruise Line is set to launch two new LNG-powered ships in 2020 and 2022 - both of which will be homeported in North America. "This agreement is a significant stepping stone in our relationship with Carnival Corporation building upon our previous LNG marine fuel supply agreements in Europe," said Tahir Faruqui, president of Shell NA LNG, LLC upon today's announcement. "It also marks a milestone as we continue to establish the marine LNG fuel market in the U.S. as a credible part of the global marine fuel mix." It also marks a milestone as we continue to establish the marine LNG fuel market in the U.S.
Tom Strang, Senior Vice President of Maritime Affairs for Carnival, said: "we are proud to be on the forefront of advancing LNG as a fuel source for the cruise industry. One of the keys to establishing LNG as a standard for powering cruise ships is building out an extensive, safe and reliable infrastructure across the globe for this clean burning fossil fuel. "We are looking forward to working closely with Shell as they help to bring LNG to North America in what we hope will be the first step in building a strong foundation for the future of LNG fuel supply for cruise ships in the region." This is the latest supply agreement between the two companies - as Ship & Bunker reported last year, Carnival signed a framework agreement with Shell Western LNG B.V. (Shell) to supply LNG bunkers for the first two of Carnival's LNG-powered ships for AIDA Cruises and Costa Cruises. Economic self-interest will prompt producers to continue pumping full-out.